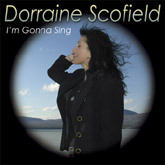 Review of Dorraine Scofield's CD "I'm Gonna Sing"
Dorraine Scofield's first solo album, I'm Gonna Sing gives us a deeper appreciation of an artist familiar to us more in the company of other area musicians than as a solo artist. As a teen Dorraine began playing fiddle in the bluegrass band, The Suttons; or you may have heard her in such divergent bands as the Pontiacs, Little Creek or Wild East. Recently, she's worked with the country-rock "covers" band Thunder Ridge and the acoustic originals trio, Blind Mice. Dorraine's maiden solo voyage is a cohesive journey through varying musical terrain which begins, disarmingly, with a gentle, lyrical acappella intro called "What Matters Now" which is like stepping into sun-warmed water before a smooth laid-back blend of instruments takes us into the title tune. Here, Scofield's 12-string cuts a path for Ralph Legnini, multi-instrumentalist and producer of the CD, to lay in oboe, synthesizer, vocals and other defining sounds which open flower-like to a strengthened tempo near the end, A mysterious, unspoken element flickers through the passage of time in the whimsical "Learn To Let Go." "If Wishes Were Horses" tilts gracefully toward country flavors with Ron Sutton's pedal steel and dobro accents and Katie Taylor's delectable harmonies before Dorraine's lead vocal on a solo acoustic ballad of love and hope is mesmerizingly laced with her own vocal accompaniment over a rock-related framework of chords. Scofield's viola and Legnini's guitar bends and bracing Hammond organ lift the spirited song of separated lovers, "It Doesn't Matter." Scofield's versatile voice is simply gorgeous on a casually bouncy tune of romantic obsession called "Boomerang." A ballad about the uprooting of a country town to provide an upstate reservoir for new york City dramatically highlights the second half of the album. Scofield, although a resident east of the Hudson River these days, grew up next to the Ashokan Reservoir in Olive and serves up "Basin Full of Tears" from a background seeped in the local lore of the massive upheaval caused by the City's incursion in the early decades of the last century. All in all, I'm Gonna Sing is a lovely progression of original tunes from a unique local talent, and ranks as an album you'll want to return to frequently.